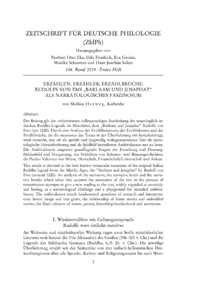 This article is devoted to the best known vernacular treatment of the original Indian Buddha legend from the Middle Ages, the Barlaam and Josaphat by Rudolf von Ems (around 1220). An analysis of the narrators, the narrative levels and the narrative breaks which takes into account the mouvance of the text in the process of transmission attempts to give a new reading to the text, widely regarded as unwieldy and boring, as a narratological challenge and a playground for intended ambivalences. The ambivalences touch fundamental questions of research and interpretation: heroic image and text genre, the relationship of frame stories and embedded stories, the fluid valences of minne, power, friendship/teacherhood and asceticism.